Environment Archives - Africa M.E. South Africa’s independent energy program is a leading example of a country utilizing its natural resources for energy. With long lasting days of sunshine, falling equipment costs, and a government confident in reducing its C02 emission, the African nation is leading the way in sustainable renewable energy on the continent. At the ‘Africa Renewable Energy Forum’ held last year in November in Marrakech, Morocco, energy ministers from all African countries, investors, financers, and technology providers discussed renewable energy plans, climate change targets and the development, enhancement, and protection of the continent’s natural resources. 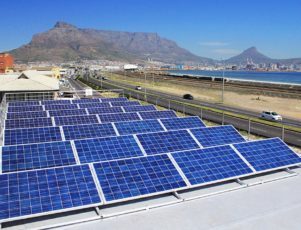 At the same time, South Africa’s Department of Energy (DOE) and Independent Power Producer (IPP) discussed plans to export their successful independent renewable energy plan to 11 other countries in Africa. South Africa’s Renewable Energy Independent Power Producer’s Procurement Programme (REIPPPP) has been successful in demonstrating that renewable energy can be delivered at lower cost, in energy terms, than new build fossil fuel options, said Sandra Coetzee, Head of Strategy at the Department of Energy’s IPP Office. Launched in 2011, the REIPPPP has attracted local and international investors with commitments of 194 billion rand (USD$14 billion) making South Africa 3rd and 4th most attractive renewable energy investment destination among emerging markets by the Climate Scope Index. By the end of 2015, 6376 MW of power was procured, of which 2 gigawatts (GW) was connected to the national grid. This is equivalent to half of the capacity of an additional coal powered station, delivered in only a third of the time, Coetzee said. Solar and wind power account for just 2 percent of South Africa’s energy needs, but just two or three years ago, there was 0 percent of renewables in the country, said Tobias Bischof-Niemz, Head of Energy at the Council for Scientific and Industrial Research (CSIR). 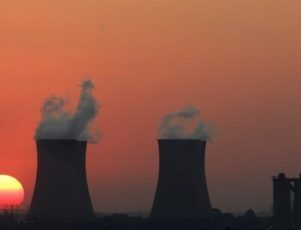 South Africa has the capacity to produce 45,000 MW of power, the largest on the continent, but greater demand has led to ongoing blackouts and an energy crisis in the emerging country. In response, the government has supported nearly 100 renewable energy projects and a plan to increase renewable energy to 21 percent of the national energy by 2030. The government also plans to reduce fossil fuel dependency from 86.5 percent to 57 percent. Renewable energy cost is 40 percent cheaper than coal, Bischof-Niemz said, and South Africa can go for a 70% renewable energy share by 2040 at the lowest cost. The country has plans to increase electricity production and maximize renewable energy sources, such as wind, hydroelectric and solar power resources. The National Development Plan has stated that by 2030 at least 95 percent of South Africa’s population will have access to either off-grid or on-grid electricity. Although South Africa is having temporary respite from load shedding, that is, power outages due to over demand, some countries in the region are experiencing 12 to 16 hours per day with no electricity, said Scott Brodsky, Partner and energy lawyer at international law firm Macfarlanes, who are advising clients across Sub-Saharan Africa on aspects of renewable and other energy projects. There are still some 654 million people on the continent who still have no access to power, said Coetzee. Meaning enormous potential for energy investment over the African continent. According to a new report by Bloomberg New Energy Finance (BNEF), entitled ‘Today’s Potential, Tomorrow’s Energy’ unsubdsidized solar energy is beginning to outcompete coal and gas. New solar projects are beginning to cost less to build and in the developing world, solar is the most cost effective source of energy, the report shows. Although an overall shift to renewable energy can be more expensive in wealthier countries, where solar must compete with existing billion dollar coal and gas plants, emerging markets, where new electricity capacity is being added as quickly as possible, clean energy will beat any other technology in most of the world, said BNEF Chairman Michael Liebreich. Although there is positive news for clean energy in developing nations and South Africa’s REIPPPP could spread across the African continent, it seems renewable energy alone will not solve South Africa’s energy crisis. 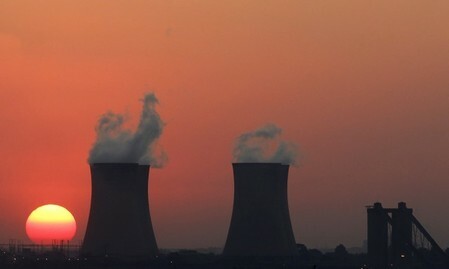 The country still has plans to build two new coal plants and even a nuclear energy plant, reports CNN. A simple and inexpensive water filtration device soon will be produced in Tanzania and marketed across the continent, where tens of millions of people do not have access to drinking water. The Waterfilter was designed for emerging nations by a group of students in India under the aegis of the nonprofit Enactus. The device is a small cistern made from clay mixed with organic materials such as coffee grounds. The cistern is heated with water inside and the organic material burns away, creating micropores that capture impurities while letting the water drip out. According to Michael Simet, a program manager with the Germany-based Enactus, the cistern can clean about two to four liters of water per hour, removing 99.9 percent of impurities. Enactus expects to start production of the Waterfilter soon in Kigoma, Tanzania. However, the nonprofit organization will not become the manufacturer. Instead Enactus plans to teach local residents how to make the device on their own, including an important process to achieve the right mix of the clay with other materials. The device will sell for $28 and is expected to last about two years, meaning the average cost is just over $1 per month. The filtration device was designed by a group of students at Delhi University’s Sri Ram College of Commerce in India, where potable water is also unavailable in many areas. 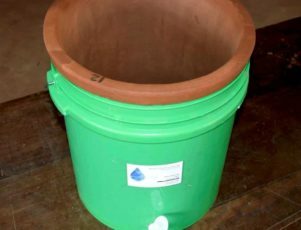 Under a project named Asbah, the student members of the Enactus SRCC Society in collaboration with the Council of Scientific and Industrial Research (SRCC) set out to develop an inexpensive clay filter that could be made and sold locally. In India, potters mix readily available river sand or sawdust with clay to create the filter. Enactus is an international nonprofit social enterprise organization of students at more than 1,600 universities in more than three dozen countries. It has about 67,000 active student members. Access to water is an urgent issue for many parts of the world, including much of Africa. As the population of the continent has grown, the number of people who do not have access to safe drinking water has increased nearly 20 percent, from 265 million in 1990 to 316 million last year. At the same time, access in sub-Saharan Africa has increased by 20 percent in the past 25 years. African stakeholders want water supply and sanitation to be considered as part of the November Climate Change conference (COP22) in Morocco in November. They want water issues to be incorporated in climate talks. 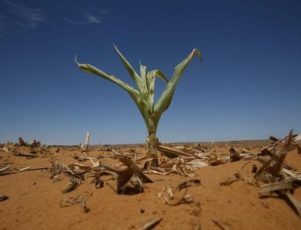 More than 20 foreign ministers, including 18 from Africa, issued a call for “Water for Africa” in July at climate change talks in Rabat to highlight the need to mobilize around pressing water issues on the continent. Kate Bayliss, a research fellow at the School of Oriental and African Studies at the University of London, said investment in water and sanitation infrastructure has lagged badly. Bayliss estimated Africa would need to spend $15 billion annually to meet its development targets. Instead, she said, spending is about $3.6 billion. William Kamkwamba is someone you may have heard of. The 29 year old Malawian is has made himself famous for his remarkable achievements and brilliant mind. Indeed, the young man has delivered inspiring TED talks, and his book, The Boy Who Harnessed the Wind is a New York Times Bestseller. Kamkwamba’s early life was difficult. Born in a poor rural community in Malawi, his family relied on farming for subsistence. In 2001, when he was just 13, a major famine swept through claimingthousands of lives and destroying entire communities. At the peak of this crisis, more than 70% of the nation’s farmers were considered at risk of starvation. Food was so scarce that Kamkwamba parents would often go without a meal so that their children could eat. For Kamkwamba, the disaster meant that his family could no longer afford to send him to school for five full years. As a natural and avid learner, he was devastated by his inability to attend class. However, determined to continue his education however he could, Kamkwamba immersed himself in books from a local lending library. Through the library, he developed a passion for engineering. He taught himself about circuitry, materials, and physics despite only having a basic understanding of English. In the aftermath of what he set up his own small business fixing people radios and other electrical appliances. Undeterred, Kamkwamba created his windmill with an old bicycle, a dynamo, PVC pipes, the fan blades from a defunct tractor, and a shock absorber. He connected his contraption to a car battery so he could store the energy he harnessed. What’s more, he completely wired his own house to include switches and a circuit breaker. Before long, local villagers were clamoring to charge their phones at Kamkwamba’s house; the only source of reliable power in the area. The news of his achievements spread across the country, and journalists came to visit. The national newspaper, The Malawi Daily Times wrote a long piece on Kamkwamba, as did Hacktivate blogger Mike McKay. The story came to the attention of Emeka Okafur, the Program Director of TEDGlobal. Fascinated by Kamkwamba’s story, Okafur invited him to TED as a fellow. Before his talk at TED, Kamkwamba had already made some serious improvements to his system. He increased the diameter and height of his first windmill, which provided power to additional houses in his village. He also built a second windmill which powers a pump and an irrigation system. Upon attending TED, his story was incredibly well received. Inspired philanthropists in the audience became mentors and benefactors. The famous satirist and TED speaker Tom Reilly pledged to support Kamkwamba through seven years of school and university. He was swiftly enrolled in the African Leadership Academy, a prestigious institution designed to rigorously prepare the talented students through academics, ethical leadership, entrepreneurialism and design. Kamkwamba then went on to study Engineering and Design at Dartmouth University, USA. Since graduating in 2014 Kamkwamba has overseen numerous wind turbine installations throughout Malawi. He intends to use his education to continue solving problems his home country is facing with. His foundation, Moving Windmills, has already delivered numerous life changing development projects across the country. A British company is bringing pay-as- you-go solar power to rural communities in a dozen countries in East and West Africa with the help of artificial intelligence. 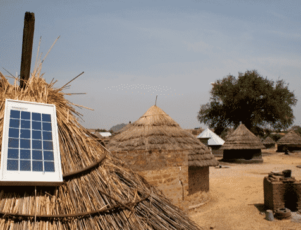 With about 90,000 customers so far, Azuri said its PayGo solar system for communities that are too remote to access a power grid has the widest reach of any such provider in sub-Saharan Africa. Using artificial intelligence, Azuri said it has solved a significant problem with off-grid solar systems. On cloudy days, solar systems may not capture and store enough energy to provide electricity for the entire evening, causing frustration for users who may be watching television, doing homework, keeping a business open in the evening or charging their cell phones for the next day. In addition to providing batteries and solar panels to customers, Azuri offers artificial intelligence technology that monitors each customer’s usage and slightly reduces electrical output to make sure power is not interrupted if the day’s supply is short. The reduction may dim the lights slightly, but it is barely noticeable, according to Simon Bransfield-Garth, chief executive officer of Azuri. With this reduction, a battery that might only provide three hours of power at regular levels of output can stretch to four or five. People “want to be able to see at night. They’re less concerned about how bright the light is. 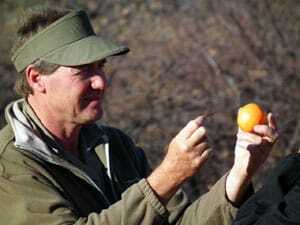 They just want to be able to see,” Bransfield-Garth said. So the artificial intelligence technology figures out the customer’s average use then looks at the battery in the evening and adjusts the brightness of the lights so customers are “guaranteed to get that duration of light every night.” “It’s like the engine controller in your car that’s looking after all sorts of things in your engine,” he said. So far, Bransfield-Garth said, the system has operated well in a diverse range of climates, from Ghana’s lengthy rainy season to Kenya’s abundant sunshine. “We have made technology that works in countries where there is a lot of sunshine and in countries where it is cloudier,” he said. Azuri’s pay-as- you-go system makes buying the package practical for many who would not be able to afford an up-front payment for the Azuri package. Using mobile payment services to buy credit on a weekly basis, customers typically pay for their equipment in 18 months, the company said. Bransfield-Garth noted that off-grid electricity costs in Africa are much higher than power costs in the west. He said burning kerosene costs about $8 per kilowatt-hour compared to U.S. electrical prices of about 15 cents. Azuri’s system frees up those costs to cover the solar payments to individuals who may earn only two or three dollars a day. He said the Azuri system is much cheaper than traditional sources, which can cost as much as 30 percent of the income of poor families. According to Azuri, solar power is an effective and environmentally safe replacement for traditional sources of light, which include burning kerosene or candles or using disposable batteries. A 2014 study of customers of Azuri’s PayGo system in western Kenya found that users expressed pride that they could provide electricity for their children to study in the evening. They also said they were saving money on charging their phones and saving more than two hours each week to go and buy kerosene. More than 85 percent said they had been able to work more since installing the Azuri system. Studying and phone charging were the most common activities, each cited by about a third of the customers. Other uses included cooking, working and socializing. The company, which is based in Cambridge, has an office in Nairobi and additional staff in five other countries. tock farming. Experts estimate Namibian cattle farming is losing $100 million a year. At the same time, experts predict that production of course grains, which are used to feed livestock, will drop by nearly one-third in southern Africa by 2030. The projection lends urgency to Namibia’s effort to maximize feed available on its rangelands. Leon Lubbe, chief rangeland researcher of the Namibia Rangeland Management Policy and Strategy, said the goal of the project is to improve both the nutrient cycle if the land as well as the water cycle in order to halt degradation by 2030. The project also seeks to restore biodiversity by nurturing key plants, practicing erosion control, reclamation of denuded rangelands, and “managing rangelands for heterogeneity rather than for homogeneity,” Lubbe said. The restoration effort, launched in 2012, is expected to take 20 years. According to the World Bank, livestock and meat production along with fisheries, tourism and mining, are major contributors to the Namibian economy – all of which are cyclical and are vulnerable to the effects of climate change, including drought. Namibia has a population of nearly 2.5 million and a gross domestic product of $11.5 billion in 2015. Namibia also has been hard hit this year by its most severe drought in more than two decades. The president of Namibia declared a state of emergency in June amid reports of crop failures and dying livestock. Business owners in the capital of Windhoek were ordered to cut water usage by 30 percent. In addition to water shortages, the encroachment of bush on grasslands is a significant challenge for livestock farmers. More than 70 million acres of Namibian rangeland are endangered by high-density bush. Government-sponsored programs such as the De-Bushing Advisory Service are helping cattle farmers clear bush with training and advice on appropriate techniques and equipment as well as practices for maintaining the land and preventing the brush from returning once it is cleared. Another promising experiment focuses on converting bush to cattle feed. A cooperative project of Namibia and Germany is testing practices in two Bush-to- Feed pilot projects. The tests are incorporating encroaching bush with other supplements to produce affordable cattle feed. A few commercial farms have already begun producing feed from bush. Organizers say Bush-to- Feed has the potential to be replicated throughout Namibia as an immediate response to severe drought in tandem with brush-clearing efforts to secure the range land in the long term. The typical process involves harvesting the encroaching bush, milling the biomass and mixing it with suitable supplements in order to increase the nutritional content and digestibility of the feed. Typically the projects use bush species including Acacia mellifera, Dycrostachys cinerea and Rigozum trichotomum. While production costs are currently high, ongoing research is expected to develop more efficient practices once the pilot projects are completed in May 2017. Experts from Namibia and around the world are expected to share best practices for reclaiming the nation’s grasslands in September during a three-day meeting of the Coordinating Unit for the National Rangeland Management Policy and Strategy. The efforts hold potential to turn around Namibia’s struggling livestock industry, which has seen declines in recent years. A 2013 drought saw the number of cattle drop from 2.9 million to 2.6 million while sheep umbers dropped from 2.7 million to 2.2 million. 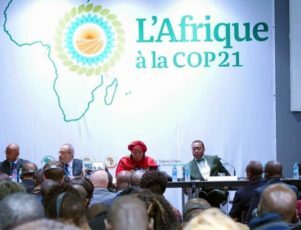 African nations brought a unified agenda to the Paris climate conference, making clear they are willing to take aggressive steps to fight global warming but need international support to make significant cuts in pollution. Africa is highly motivated. Ironically, it is the least polluting of the world’s continents, but it has suffered some of the most severe effects so far – drought in some regions and severe flooding in others. As the Paris conference drew to a close, key issues of vital interest to Africa were under debate, including the allocation of responsibility for reducing carbon emissions between rich and poor countries as well as how to finance clean-energy improvements and repair damage already done. “African countries have demonstrated greater ambition in cutting their emissions than the high-emitting nations,” Akinwumi Adesina, president of the African Development Bank, said. Forty-seven of 53 African countries had completed plans to cut emissions by an October deadline, he said. Alassane Ouattara, President of Côte d’Ivoire, said his country has set a goal of reducing greenhouse emissions by 28 percent by 2030 by increasing renewable sources, reforestation and development of carbon neutral agriculture. Morocco recently increased its goal to increase renewables from 42 percent in 2020 to 52 percent in 2030. At the same time, numerous African nations made clear that they would need international support to make good on their pledges. Yemen pledged a 1 percent cut in emissions by 2030 without international support or by 14 percent cut if international support was forthcoming. Adesina said Africa needs an international investment of $55 billion a year up to 2030 to create a more efficient energy sector that uses more renewable resources for power. He said the African Development Bank would contribute $5 billion in financing, which will represent 40 percent of its total investments. The United Nations has estimated it will take more than $93 billion a year for the world’s 48 poorest, least developed countries, including 34 in Africa, to put their action plans into effect. Of more than $60 billion that has been committed so far, less than a third goes to the poorest countries, according to a November 2015 report by the International Institute for Environment and Development. African leaders also stressed the need for financial help to confront losses climate change has already wrought in their countries. The United Nation’s Adaptation Fund “must be reinforced to support the losses and damages suffered by developing countries,” Denis Sassou Nguesso, President of Congo, said, echoing comments of many African leaders. Currently, the negative effects include drought in South African, Mozambique, Botswana and Zimbabwe as well as heavy rains, landslides and flooding in Burundi, Nigeria, and Somalia. The Great Green Wall aims to cultivate more forested land in Africa to fight the effects of climate change. 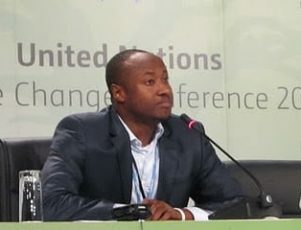 Adesina and other African leaders also pointed to the opportunities – both economic and environmental – that significant climate change work could unleash. For example, the continent has significant capacity to produce wind and solar power, as well as potential geothermal power. African forests have the potential to absorb tons of carbon emissions and reforestation efforts are under way to grow forest stock. Among the efforts unveiled at the Paris conference is the African Restoration Initiative, a coalition of African countries and donors who seek to restore 250 million acres of degraded or deforested land by 2030. As their development accelerates, African nations also are poised to benefit from clean industrialization, tapping technologies that have emerged in the past decade rather than relying heavily on older, carbon-hungry machinery. “Industrialized countries will have to retrofit older infrastructure to harness the sector’s vast potential. Africa, however, is not married to any technological platform and is ready to leapfrog to these new, efficient and more sophisticated technologies,” Carlos Lopes, executive secretary of the United Nations Economic Commission for Africa, said at the Paris conference. As Africa looks ahead to the challenges and opportunities of climate change, Adesina of the African Development Bank contrasted its position today with that of the last climate conference.